Award Winning HAWKs at Historicon 2017 | H.A.W.K.S. 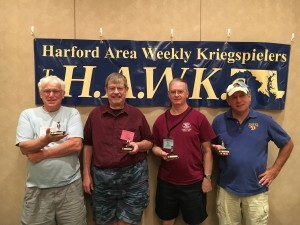 We had four HAWKs win awards at Historicon 2017. Geoff won an award for this Lego pirate game for kids. Chris Johnson won an award for his American Civil War game for kids. Don won an award for his Battleground WWII game on our French village table. Eric won an award for his American Civil War game for kids.